It is a beautiful tale that most Americans know well. The fact that it is mostly a fairy tale has not diminished its popularity. The true story of the first Thanksgiving is one that is just as compelling. It is a story of triumph over adversity, and an even stronger moral to it. In 1620 a band of travelers left their homelands for good, risking all for a chance at freedom. With both anticipation and foreboding, they boarded a ship called the Mayflower for the long journey to a new world and a new life. Due to circumstances beyond their control, they had to leave much later that summer than they had anticipated. When they arrived, a harsh Little Ice Age winter was nearly upon them. With it already fall, they quickly learned how ill prepared they were for the task ahead of them. With no time to waste, the area for the settlement was chosen and dutifully cordon off. Slipshod housing and storage sheds were built just in time to shield them from the heavy snows and bitter cold. They had some meager supplies, but not enough to last the long cold winter ahead. Even with another harsh winter upon them, and stores low, the Pilgrims prepared a traditional harvest festival and feast. The men went out and shot deer and fowl (which probably included turkey), the women gathered what they could, and a feast was prepared. After passing another long and hungry winter Governor Bradford had seen enough. The Pilgrims were barely surviving after two summers, and 60 more settlers were scheduled to arrive in late summer. That meant they would need enough supplies to feed 60 more mouths! Another substandard harvest would likely mean mass starvation and loss of the settlement. What about Squanto? He was real and with a compelling story all his own. A English speaking Indian who had spent some years in Europe, he befriended the Pilgrims. The fact that there was a English speaking native familiar with their ways must of seemed like divine providence at the time (and probably was). Squanto did help the Pilgrims in many ways. He, as the legend says, introduced them to Indian corn, a stable of local tribes. Contrary to the legend, food was not his greatest contribution towards their survival. His ability to negotiate, on their behalf, with the local tribes proved invaluable. Through him the Pilgrims were able to trade with the local population, and set up alliances. 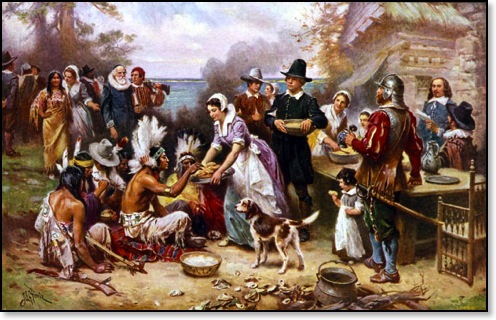 It was because of his efforts the Pilgrims relationship with the local inhabitants was mostly peaceful and fruitful. In fact, it would not be until after this first generation was gone that any substantial conflicts would arise between Plymouth settlement and local Indians.